Characterization of temporally varying structure of reacting molecules is crucial for understanding the mechanism and function of a chemical reaction. However, it is not easy to capture the structure of such reaction intermediate in real-time, especially in the solution phase. 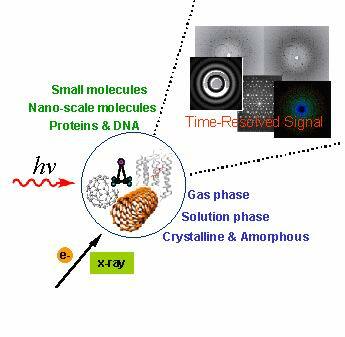 Time-resolved X-ray liquidography (TRXL) was developed to directly monitor the molecular structural dynamics of chemical reactions in solution. Due to the structural sensitivity of X-ray scattering and superb time resolution of ultrashort X-ray and laser pulses, TRXL has been widely applied to understand the reaction mechanisms of a variety of molecules ranging from small molecules to proteins. Halogen elimination reactions of haloalkanes have attracted much interest since their products are formed under a stereochemical control. TRXL was applied to identify the intermediates of the elimination reaction of 1,2-diiodoethane (C2H4I2). Upon irradiation at 267 nm, haloethane dissociates into a haloethyl radical and an iodine atom. Of particular interest is the molecular structure of the haloethyl radical because a bridged structure rather than an open classical structure (anti and gauche) had been proposed to explain the observed stereoselectivity of certain chemical processes but had never been directly observed. From the TRXL result, it was clearly elucidated that the bridged structure is strongly favored over the open classical structure, as was supported by quantum mechanical calculation. The triangular metal carbonyl cluster Ru3(CO)12 is widely used as a catalyst in controlled photoactivated synthesis. However, the reaction mechanism and intermediates of the photocatalyst has been elusive. TRXL was used to probe the photoreaction of Ru3(CO)12 in cyclohexane, and a new intermediate (Ru3(CO)10 with only terminal CO ligands) was identified in addition to two μ-CO intermediates reported from previous studies using ultrafast IR spectroscopy. Also, it was revealed that the three intermediates, Ru3(CO)10 with only terminal CO ligands, Ru3(CO)11(μ-CO) and Ru3(CO)10(μ-CO), undergo different photodissociation pathways at 260 nm and 390 nm. In the biological world, proteins play a crucial role in sustaining the life by performing their function in a precisely coordinated manner. One of the major objectives for biologists and chemists is to understand the operational mechanisms of proteins at the molecular level. As an effort to achieve this goal, TRXL and time-resolved X-ray Laue crystallography were applied to various proteins, e.g. hemoglobin and myoglobin. From the measurements, the tertiary and quaternary conformational changes of hemoglobin and myoglobin were visualized under physiological conditions. These results demonstrate that TRXL not only gives insights to the structural dynamics of proteins in their natural environment but also complements time-resolved optical spectroscopy and X-ray crystallography. The Mo and Ru carbenes are transition metal catalysts that can facilitate a variety of metathesis reactions among alkene, alkyne and allene substrates. To understand the quantitative relationships of catalyst-substrate association for diverse metathesis Mo and Ru catalysts, the preference for the substrates were examined by applying time-dependent fluorescence quenching. The studied substrate preferences are as follows: alkyne > alkene > allene for Mo-1 and Mo-2, allene > alkene > alkyne for Ru-1 and Ru-3, and alkyne > allene > alkene for Ru-2 and Ru-4 (Mo-1, Schrock Mo; Mo-2, Schrock-Hoveyda Mo; Ru-1, Grubbs first generation Ru; Ru-2, Grubbs second generation Ru; Ru-3:, Grubbs-Hoveyda first generation Ru; and Ru-4, Grubbs-Hoveyda second generation Ru). The result provides a new insight to the metathesis reactions and addresses the mechanism of reaction initiation in enyne or allenyne metathesis. Professor Ihee and his research group have used time-resolved X-ray Liquidography (TRXL) to identify the intermediates of the elimination reaction of haloethane (C2H4I2). Upon irradiation at 267 nm, haloethane dissociates into a haloethyl radical and an iodine atom. Of particular interest is the molecular structure of the haloethyl radical because a bridged structure rather than open classical structure (anti and gauche) had been proposed to explain the observed stereoselectivity of certain chemical processes but had never been directly observed. According to the TRXL result, the bridged structure is strongly favored rather than open classical structure and is also predicted by quantum mechanical calculation. TRXL was used to probe the photolysis of Ru3(CO)12 in cyclohexane, and a new intermediate (Ru3(CO)10 with terminal CO only) was identified besides the two μ-CO intermediates known from ultrafast IR spectroscopy. 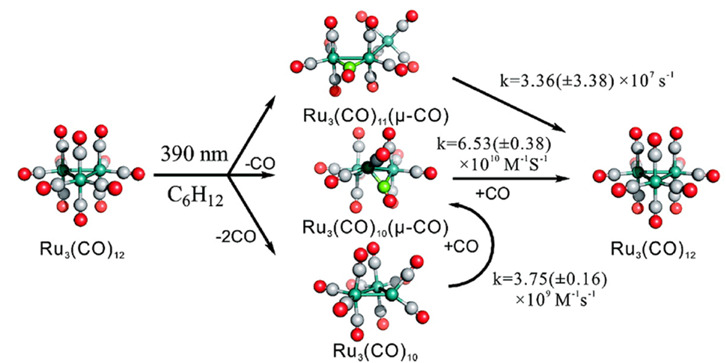 Three intermediates, Ru3(CO)10 with terminal CO only, Ru3(CO)11(μ-CO) and Ru3(CO)10(μ-CO), undergo different photodissociation pathways at 260 nm and 390 nm. Professor Ihee demonstrates tracking of protein structural changes with pump-probe X-ray protein liquidography with picosecond time resolution. We investigated the tertiary and quaternary conformational changes of hemoglobin and myoglobin under nearly physiological conditions triggered by laser-induced ligand photolysis. 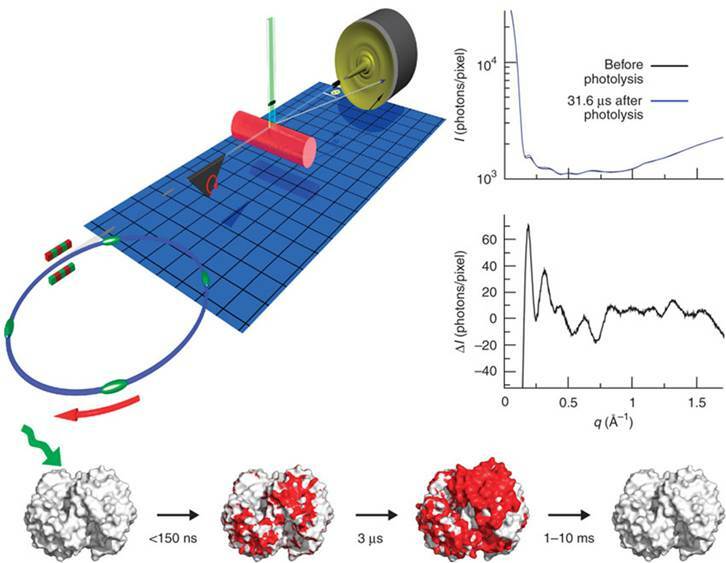 By providing insights into the structural dynamics of proteins functioning in their natural environment, pump-probe X-ray protein liquidography complements and extends results obtained with time-resolved optical spectroscopy and X-ray Laue crystallography. We also identify a complex chemical mechanism and all atomic structures of five distinct structural intermediates of the blue light photoreceptor photoactive yellow protein (PYP) using time-resolved X-ray Laue crystallography. Quantitative catalyst-substrate association relationships of diverse metathesis Mo and Ru catalysts to their substrates are determined directly by a general method based on FRET principle. The determined substrate preferences exhibit the order of alkyne > alkene > allene for Mo-1 and Mo-2, allene > alkene > alkyne for Ru-1 and Ru-3, and alkyne > allene > alkene for Ru-2 and Ru-4. (Mo-1, Schrock Mo; Mo-2, Schrock-Hoveyda Mo; Ru-1, Grubbs first generation Ru; Ru-2, Grubbs second generation Ru;Ru-3:, Grubbs-Hoveyda first generation Ru; and Ru-4, Grubbs-Hoveyda second generation Ru). Reaction mechanism and the structures of reaction intermediates of chemical reactions are often hotly debated. However, the direct observation of these intermediates has proven quite elusive because the atoms are so small and the time it takes for them to slip past their neighbors is so short. The diffraction methods make use of photons or particles that can be produced in pulses shorter than 10-12s, and are therefore uniquely suited for structural determinations with ultrafast time resolution. Among many molecular systems, the structure of C2H4I radical that purportedly plays a crucial role in the stereoselective chemical reaction of diiodoethane (C2H4I2) has been identified using time-resolved x-ray diffraction by Hyotcherl Ihee and his coworkers (Science 309(2005):1223). The technique of picosecond time-resolved liquid diffraction can provide an unprecedented glimpse into the structures of reactive intermediates involved in solution-phase chemistry and can reveal the structural dynamics of more complex system such as organometallics and protein. The technique, time-resolved wide-angle X-ray scattering (TR-WAXS), is an enhanced version of WAXS, which has generally been limited to millisecond time-resolution. TR-WAXS improves its time window for observing the kinetics of protein conformational changes by about a millionfold, down to the nanosecond range. 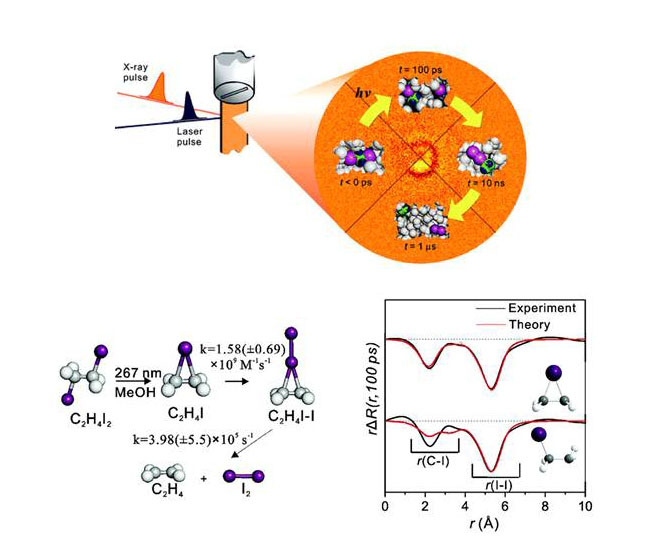 Hyotcherl Ihee and his coworkers devised TR-WAXS and demonstrated its capabilities by using it to visualize nanosecond conformational changes in hemoglobin caused by photodissociation of carbon monoxide. They also used it to watch cytochrome c fold and to observe nanosecond conformational changes in myoglobin. (Nature Methods, 5, 881 (2008)) William A. Eaton, a protein physical chemist at NIH, said that TR-WAXS could make it possible to watch enzymes work and to see how enzyme conformational changes play a role in enzyme function. One of the most fundamental questions in biology, chemistry, and physics is how the molecules interact, so called, reaction mechanisms. Our laboratory strives to understand the reaction mechanisms in molecular detail in gas phase, solution phase, and solid phase spanning amorphous phase, polycrystalline and single crystals. Traditionally, femtosecond spectroscopy has been used to achieve this goal, however, spectroscopic data, in most cases, fail to provide direct information on the structural changes such as bond lengths and bond angles. To remedy this, we combine the traditional femtoscience with direct structural tools such as diffraction, EXAFS, and NMR. These techniques can be applied to a wide range of systems, encompassing small molecules, nano-scale complexes, and macromolecules such as polymers, proteins and DNA. A typical experiment is conducted in a pump-probe manner; an optical pulse such as femtosecond laser pulse is directed to the sample of interest to initiate a desired reaction, and after a well-defined time delay, a probing pulse such as an ultrashort x-ray pulse is sent to the sample undergoing a reaction. Then, the signal resulted from the interaction of the reacting system and the probing pulse captures the molecular actions in real time. Since the measured signal (in this case, diffraction signal) is a function of molecular structures, the time-dependant data at various time delays contains a clue to the molecular reaction mechanisms and a novel data analysis of the time-resolved signal finally reveals the mechanism. Our laboratory is interested in the reaction mechanisms of various proteins such as a blue light photoreceptor, bacteriorhodopsin, phytochrome, and LOV2 domain. These proteins play indispensible roles in the signal transduction pathway of a cellular system. The time-resolved X-ray Laue diffraction on a single crystal is currently the only method which can provide us detailed real-time structural information in sub-nanosecond time resolution at room temperature.The experiment is conducted at a third generation synchrotron facility such as ESRF and APS as the time-resolved X-ray liquid experiment. The difference is that the long-range order found in a single crystal enhances the diffraction signal and reduce the background significantly. Diffuse signal from disordered molecules becomes sharp peaks. Generally, a ns or fs laser pulse triggers the protein dynamics in a single crystal of proteins and a polychromatic, ultrashort X-ray pulse from a beamline of a synchrotron radiation facility sweeps through the single crystal. The resulting diffraction pattern is then recorded in a charge-coupled device (CCD) based detection system. Typically a better time resolution can be achieved when the single crystal is kept still and a polychromatic X-ray beam is used for diffraction unlike a traditional X-ray crystallographic experiment where a diffraction pattern of a monochromatic X-ray beam is measured on an oscillating crystal. However, our laboratory is also developing a new technique of achieving a better time resolution with the traditional monochromatic X-ray pulses so that a wider range of protein reactions can be studied. Third-generation synchrotron radiation facility such as European Synchrotron Radiation Facility (ESRF) and Advanced Photon Source (APS) can generate an X-ray pulse as short as 100 picoseconds (ps, 10-12). Our laboratory conducts time-resolved experiments by utilizing such an ultrashort X-ray pulse as a probe. Of great interest is the molecular structure of short-lived intermediates and solute-solvent interactions in solution phase. X-ray has a much longer penetration depth than electron does, and this characteristic makes X-ray suited for solution studies. Although the current time resolution is generally behind that of time-resolved electron diffraction, a future X-ray source based on free electron laser technology will realize femtosecond (fs, 10-12) time resolution, opening up a new possibility of capturing the movement of molecules in real time. So far, a series of successful time-resolved X-ray diffraction experiments have been conducted on reactions of various small molecules and we are currently expanding this technique to study macromolecules such as nano-scale complexes and proteins. Modern scientific advances have confirmed that experiments alone cannot provide a full story and convincing explanations on complex reaction mechanisms. Therefore, all our experimental endeavors accompany theoretical calculations including both ab-initio and DFT quantum chemical calculations and molecular dynamics simulations. Selected examples are molecular structures of short-lived intermediates, the photo-reaction of solute molecules in solution, and reaction pathway of proteins. With the advance of fs laser technology and electron gun design, the time resolution of ultrafast electron diffraction has reached near 1 ps. This impressive time resolution has enabled us to capture the molecular structure of short-lived intermediates. However, the fundamental bond-making and bond-breaking processes occur in femtosecond regime, which is beyond the current technology. Our laboratory is developing a next-generation ultrafast electron diffraction technique, which is femtosecond electron diffraction (FED). This new technique is based on a light-driven RF electron gun producing a near-relativistic electron pulse. Upon realization of this new technique, a molecular vibration will be directly captured, fulfilling one of chemists' dreams.